After the initial success on Steam Early Access and Xbox One Game Preview, Studio Wildcard continues to expand ARK: Survival Evolved. The highly popular survival game, which is getting an ARK Park VR experience thanks to the partnership with Snail Games, released this week on Sony’s PlayStation 4. This came as a surprise to some since just a few months ago, the team stated that Sony wouldn’t allow ARK: Survival Evolved to be launched on the platform until the game was finished. We reached out to Lead Programmer and Co-Founder Jeremy Stieglitz to find out what happened behind the scenes, as well as Studio Wildcard’s impressions of the new PlayStation 4 Pro console, the chances of ARK getting PSVR compatibility and the developer’s stance on crossplay between platforms. Note: the game literally just received the first PS4 update (around 375mb) Stieglitz mentioned below. This update adds the 1080P option for PS4 Pro and fixes a hard crash issue. Just four months ago, you stated that Sony wouldn’t allow the game to be released on PS4 until it had been finished. What changed – Sony’s stance or perhaps the fact that you’re now closer to final game release? Sony told us that if we go through Final Quality Assurance — the full set of technical requirements that a shipping game needs to pass — then it’s OK if we plan to add more content and features to the game post-release. Hence technically it’s not “Early Access”, but it’s not “Final Content Complete” either. I have no doubt that ARK fans clamoring for the game on the console also were part of it, so thank you to everyone for making ARK happen on PS4! 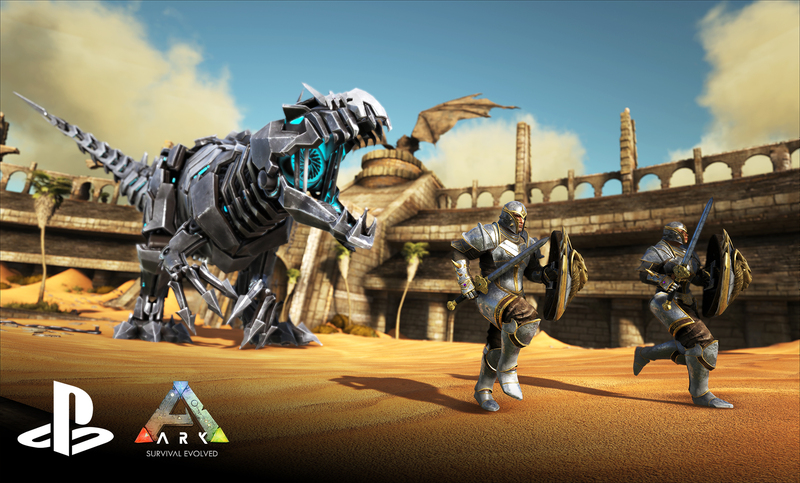 What resolution and framerate are you targeting for the base PS4 version of Ark: Survival Evolved? On the PS4 Pro, 60 FPS at 720p,or 30-60 FPS at 1080p, depending on “Detailed Graphics” setting. Many PlayStation gamers would be willing to play Ark: Survival Evolved via PlayStation VR. Back in June, you told us that you still planned to do it – is there any update on this front? We’re currently evaluating whether we can do it as an exclusive feature to PlayStation 4 Pro. If we can, then it will be straightforward. The performance requirements of VR are intense! What do you think of Sony’s PS4 Pro performance as a developer? Were you impressed by the hardware or not? Very impressed with its performance, at a very reasonable price. We estimate it would cost at least $900 to build a similarly powerful PC, and that’s if you were custom-building it with extreme cost control. We estimate its raw GPU performance is similar to an NVIDIA 970, and along with CPU improvements and overall more memory, it’s a really high benchmark for console performance. Hats off to Sony for “crossing the Rubicon” of console hardware updates (bonus that it tends to improve performance in just about every existing title in the PlayStation 4 library)! During the recent live stream, you mentioned that PS4 Pro performance in the game would get certain improvements. Could you go into finer detail and let us know the specifics of this enhanced version? An impending update (which might hit tomorrow!) includes an Optional 1080p mode which runs 30-60 FPS, while defaulting to 60 FPS 720p mode. Also, we’ll be bumping up the Texture Resolution on the PS4 Pro in a subsequent update, since after all it has 500+ MB additional title-usable memory we want to make use of! Have you evaluated adding HDR support on both Xbox One S and PlayStation 4? If not, why? We haven’t evaluated HDR support yet, as I still need to get my HDR TV to work really well… once I have, then I can better determine how much we can do with it in ARK. The good news is, ARK is very HDR-centric under the hood, for example there are massive real-world light value difference between jungle areas and the bright outdoor sun. ARK uses tone mapping and auto exposure adjustment to squash those values into Low Dynamic Range for regular monitors, but in theory with an HDR-ready display we could make more effective use of those extreme light intensity value differences. What would it take for PS4/XB1 cross-play to be activated? Do you have to talk to both Microsoft and Sony about it? At this moment, we’re just targeting PS4 to PC and Xbox One to PC (the PC server hosts will have to choose which console platform they want to support, if any) — not Xbox One to PS4. But it is technically possible, so maybe we’ll get lucky and get approval for that too, we’re certainly going to try!